Looking at the night sky and its endless wonder is incomparable, true; but, to have that wonder captured in pictures is a fabulous treat, and a great way to spend your time. This article is going to look at some aspects of night photography, and the best DSLR cameras for astrophotography. Let’s go. Astrophotography primarily takes time at night, so you have to keep the aspects of low light photography in mind. For best results, you should carry out your astrophotography session on a new moon night, when it’s invisible or a slender crescent. Moreover, you should make sure to shoot away from city lights, as that can cause light pollution in your photos. The problem of shooting in low-light is that you do not have sufficient light, and your camera will constantly indicate that your scene is underexposed. Low light photography can be quite challenging, and this is where you need to bring in your low light photography skills. Three factors affect the exposure of your photo, or how bright your photo is: ISO, shutter speed, and aperture. What is a cropped frame sensor? What is IR cut filter? What is UT-1 Communications Unit? What is a mirrorless digital camera? What is a back illuminated sensor? ISO stands for International Organization for Standardization. But that does not explain a thing. So, let’s dig deeper. ISO has been in use since 1974. When photographic films were in use, the ISO was directly linked to the quality of the film. The higher the ISO of the film, the larger the pieces of silver on the film; larger silver pieces meant that they could capture more light. But now we have ISO in digital cameras as well. Only difference is that photographic film has been replaced by digital sensors. Photographers normally use a low ISO number as that presents a better image, without noise. The grainy texture of a high ISO picture is called noise. But, when you don’t have sufficient light, you will either end up with a blurry image (if you use low shutter speed), or a dark one. And no one wants either of those. To deal with this problem, you have to increase the ISO of your camera. ISO refers to the sensitivity of a DSLR camera’s digital sensors to light. When it comes to astrophotography, you need a DSLR camera with an excellent native ISO range. A higher ISO lets you take a brighter photo but it also increases noise in your photo. When you take a photo of the night sky, you don’t want to end up with more stars in your photo than there are in the sky. For this reason, you need a camera with a good native, or base, ISO range, because this is the range at which your camera shoots pictures with the least amount of noise. This can also be considered your camera’s optimum ISO range. Another factor that affects your astrophotography session is the sensor size of your camera. The larger the sensor on your camera, the more light it can capture, therefore presenting you with brighter images. So, when getting a DSLR camera for astrophotography, you must check its sensor size. Larger sensor size means that you will have to pay more for it as they are expensive to produce. But, when you are an astrophotography enthusiast, you need to invest in good gadgets to enhance your experience. DSLR cameras with a 35 mm sensor size are the best solution to this issue, as they are reasonably priced and offer bright images. Your camera’s shutter speed determines how much light your camera lets in before shooting a photo. The higher the shutter speed, the lower your picture’s brightness; and the lower the shutter speed, the brighter your picture. However, with low shutter speed, you might often end up with blurry images due to motion. To deal with this problem, you need to use a tripod. Since DSLR cameras are lighter than most telescopes (see our recommendations), you won’t require a big equatorial mount; a regular camera mount will suffice.. All DSLR cameras have a variety of shutter speeds, and what speed you choose is according to your requirement. Next comes aperture, which is a hole in the camera’s lens that lets light through. The width of aperture varies from lens to lens. The wider the aperture, the brighter your photo. A DSLR camera works with a variety of lenses so you can choose according to your requirement. 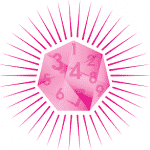 Now that we are done with the basics, let’s move on to the purpose of this article. And that is to help you choose between the best DSLR cameras for astrophotography. 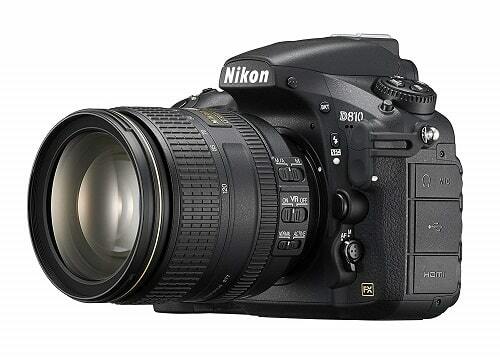 The Nikon D810 has brought about an evolution of resolution. It is a full frame 36.3 megapixel CMOS sensor without an Optical Low Pass Filter (OLPF). The specialty of this filter is that it produces extremely sharp images, hence the evolution of resolution. It features an Expeed 4 image processing engine, a 51 point autofocus system and an ISO range that can be expanded upto 51200. This DSLR also includes the option to produce 16 megapixel pictures with smaller file sizes, thanks to RAW Small Size. With the Nikon D810, you can now make high quality videos just like the ones that professionals make. The combination of the amazing features of the Nikon D810 presents you with images that have stunning detail, sharpness, and minimum noise. It’s expandable ISO ensures that you can take bright photos, even in low light conditions, therefore making it one of the best DSLR cameras for astrophotography. The D810 features ISO Auto Adjust, which lets you record videos and move between light and dark scenes without having to adjust iris and frame-rate. This camera truly enhances your photography output. Take your photography and videography to the next level with the D810. This DSLR camera has been totally redesigned in the area of mirror and shutter mechanisms, which has improved the camera’s performance. Shutter noise and vibration has been considerably reduced as compared to previous models, therefore resulting in clearer and more stable pictures. It also features an improved LCD screen in which you can change the color balance of your display according to your taste. You can now see celestial bodies on your DSLR camera’s live view in a better color while you focus and shoot. With this camera, you can now shoot upto 9999 photos to make a time lapse. Just imagine how smooth your time lapse will be with this range of images. 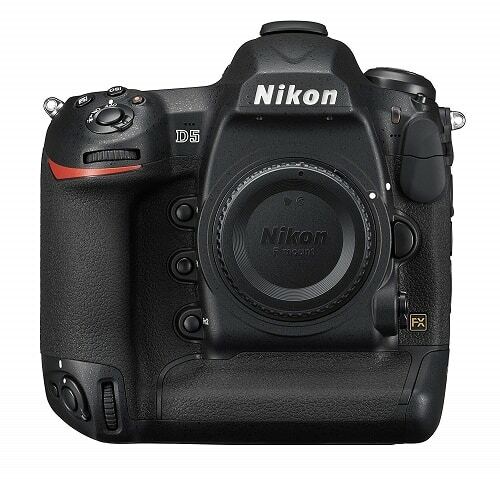 The Nikon D810 is designed to satisfy your creativity. The Nikon D810 is one of the best DSLR cameras for astrophotography, thanks to its high resolution images. Its superb ISO performance, minimal shutter vibration and mirror slap, and full frame format will present you with detailed, crisp, and spectacular shots of the night sky. Moreover, you can also make smooth and mesmerizing time lapses with the D810, which will add wonders to your collection of astro photos and videos. This is one of the most expensive and the best DSLR cameras for astrophotography these days. This is the first full-frame camera that is designed specifically for deep-sky astrophotography. It is a 36.3 megapixel camera with specialized IR cut filter, built-in time lapse, continuous and interval shooting, and it lets you take long exposure photos upto 15 minutes. Traditional DSLRs are equipped with sensors that block red light, including infrared. The specialized infrared cut filter in the Nikon D810A means that you can take pictures of distant galaxies and nebulae that emit red color. You can capture celestial objects in astonishing detail with this camera. To enable you to capture clear long exposure images, the Nikon D810A features an electronic front curtain shutter that eliminates inner vibration. The camera comes with a free software that includes an Astro Noise Reduction Filter which can be used to eliminate pixel artifacts. The Nikon D810A lets you capture upto almost ten thousand photos for creating a smooth time-lapse using the camera’s Interval Timer. This DSLR camera has a strong build so that it can handle lengthy outdoor sessions; it has a sturdy body made of magnesium alloy and can withstand different weather conditions. And because night time photography takes place outdoors, this is one of the best dslr cameras for astrophotography. If you are not on a budget, and willing to invest a lot in your hobby of astrophotography, then this is the camera for you. It will make your astrophotography an incredible experience by presenting you with amazing images of the night sky and its wonders. Moreover, this DSLR camera for astrophotography gives you the freedom to test your creativity. It can be used with a great number of Nikkor lenses, ranging from prime lens to telephoto lens. With this DSLR camera, the sky is not the limit. 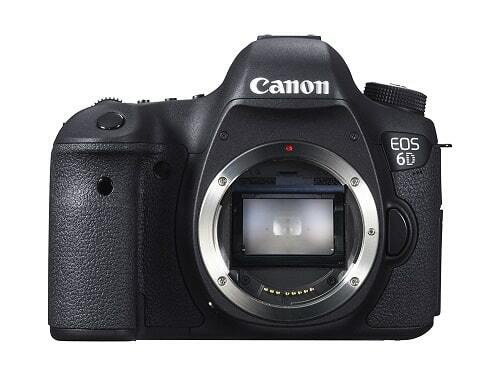 The Canon EOS 6D is yet another incredible full-frame DSLR camera for astrophotography. It is a 20.2 megapixel DSLR with CMOS sensor. It lets you record in 1080p HD with manual controls and has a 3 inch LCD so you can have a larger view of your subject while focusing and shooting. The 11 point auto focus system enables you to get sharp and clear pictures. Furthermore, it has a wide range of ISO from 100 to 25600, meaning that you can take amazing photos even in low light settings – and that is just what you need for astrophotography. This DSLR camera also features a built-in WiFi transmitter so you can conveniently transfer pictures from your camera to social media through Canon iMage Gateway. You can even print your pictures directly from the camera if you have a Wi-Fi compatible printer. Moreover, you can download EOS Remote app on your android or iOS phone and upload from anywhere. Amaze your friends on Instagram with surreal pictures of the night sky. The Canon EOS 6D is just the tool for unlocking your potential and creativity when it comes to astrophotography. The camera’s built-in GPS lets location information to be collected and recorded during shooting, so you can travel around and take photos without noting down where you took which shot. Moreover, it is a compact and lightweight DSLR camera so you can easily carry it around. The camera’s full frame CMOS sensor ensures high resolution and detail in your photography, combined with incredible performance and speed. The sensor also has an amazing signal to noise ratio and strong noise reduction that result in clear pictures. It uses DIGIC 5+ Image Processor that reduces noise when you shoot at greater ISOs. The DIGIC 5+ Image Processor also reduces chromatic aberration, so you end up with pictures that are as close to reality as possible. Thanks to the Canon EOS 6D’s powerful processor, you will feel the speed of the camera the moment you turn it on. This DSLR camera allows you to capture 4.5 fps, so if you see a shooting star and you have Canon EOS 6D on your tripod, you’re in luck. With this camera, you won’t miss a scene, no matter how rapidly it unravels. Being a modern camera of the modern world, the Canon EOS 6D lets you control exposure settings, such as aperture, shutter speed, and ISO, with your iOS or android smartphone. All you need is Canon’s free remote app. Using the camera’s built-in WiFi, you can easily transfer photos to your phone and review them on it without having to use a computer. You can just as easily print them out with a Wi-Fi compatible printer. The camera itself is a complete package, without needing other accessories. Another amazing feature of the Canon EOS 6D is its Integrated Cleaning System. To avoid accumulation of dust, the Integrated Cleaning System removes dust particles from the glass surface by vibrating the glass. At the bottom of the camera is an absorbent that absorbs all the dust particles, resulting in clearer images. With its HDR mode, the Canon EOS 6D captures three images of varying exposures, and merges them into one photo offering stunning detail. It also features Special Scenes mode: HDR Backlight Control and Handheld Night Scene. The HDR Backlight Control mode combines three images (underexposed, properly exposed, overexposed) to make sure that backlit subjects are not too dark. Nightscapes that have bright highlights and dark areas can be captured using the Handheld Night Scene mode; in this mode, the camera combines four images to present dramatic shots. Its fast shutter speed avoids any blur due to camera shake. Although the Canon EOS 6D has lesser megapixels than its competing DSLR cameras, its other features such as noise reduction, built in GPS and WiFi, Integrated Cleaning System, and various special scenes mode make it one of the best DSLR cameras for astrophotography. It is also reasonably priced and will last you a lifetime if looked after properly, and you probably won’t need to invest in another camera, just lenses. Moreover, this camera can be used for regular photography as well, and not just astrophotography. So if you are a photographer who does not specialize in just night time sky photography, then this is an amazing pick for you. Released just recently, the Nikon D5 is a 20.8 megapixel camera with CMOS sensor, Expeed 5 Image Processor, and a 3.2 inch touchscreen LCD. It allows video recording in 4k at 30 fps, has a 153 point autofocus system, and a native ISO of 102400 that can be extended upto 3280000. You can also take upto 200 shots at 12 fps. As the manufacturer states, this is not iteration, this is innovation. Due to its superb AF system, the Nikon D5 is an extraordinary DSLR camera that can identify and focus automatically on its subjects, even if they are fast-moving. It’s a game-changer when it comes to shooting rapidly moving subjects. The camera has a second processor which is dedicated entirely to autofocus operation; coupled with mirror sequencing mechanism, the Nikon D5 makes sure that you get sharp and bright images, even if your subject is moving. D5’s autofocus is not just good, it is exceptional, and you are going to find that out when you first use it. It does not miss! If you’re looking to make a time-lapse of the miraculous night sky, you are in for a real treat. The D5’s 4K UHD video lets you record amazing videos and time-lapses that is bound to make you and your friends go wow. The best thing about time-lapses is that you can record them right in your camera – isn’t that marvelous? The Nikon D5 truly is spectacular innovation, as its manufacturer states. The camera’s high ISO performance is incredible, and being an astrophotographer, you are truly going to love it because this is exactly what you need for low light photography. The Nikon D5 won’t disappoint you, it will always step up when the light is low and present you with surreal images of the night sky. It is a solid and well-built camera that you are going to use for a very long time. It has a strong body that is designed to keep it going even through tough weather conditions, so you don’t have to worry about the rain and storm keeping you from indulging in astrophotography. You can even capture lightning and thunder with your amazing Nikon D5. Nothing is going to stop you now. However, it is quite a heavy camera, which some photographers, specially campers, might find difficult to carry around. The Nikon D5 has a great battery life, and you can take upto 3000 photos in a single charge. Battery life is useful specially when making time-lapses. There is one feature that some photographers might find disappointing – the D5 has no built-in flash. But it has a very high ISO range so this should not pose much of a problem. This DSLR camera features a 3.2 inch LCD touchscreen which has an interface like a smartphone. Not only can you view your subject in the live view, you can even choose your focus points, and zoom in or out with just the touch of your finger. The Nikon D5 has brought a total transformation to the art of photography, making it one of the best DSLR cameras for astrophotography. The Nikon D5 is a strong and heavy camera, both in your hands and on your pocket. So, when deciding to buy it, you probably need to check with your parents, better half, or your bank account before investing in it. As an astrophotographer, this is definitely one of the best DSLR cameras that you can invest in. It is totally going to change your astrophotography sessions and each photo you shoot will marvel you and your friends. Although the camera does not have fancy features like built-in WiFi and GPS, the Nikon D5 is the master of low light photography and that is exactly what you need for astrophotography. So, if you have the money, go and get it because there is no other camera that can perform and capture images as well as the Nikon D5. 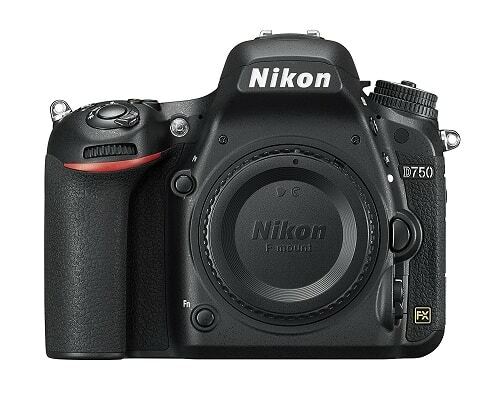 The Nikon D750 is a full-frame DSLR with 24.3 megapixels and a CMOS image sensor. It comes with an Expeed 4 Image Processor, offers HD video and has a built-in WiFi. It has a 51 point AF system, and a wide range of ISO that can be expanded upto 51200. The D750 lets you take 9999 images in-camera for a smooth time-lapse. You can use the camera with a compatible tablet or smartphone that will serve as a remote screen and let you see what is on your DSLR’s live view; you will love this feature as it widens up photography possibilities. It is the first Nikon DSLR that features a 3.2 inch tilting LCD. The D750’s CMOS sensor coupled with the Expeed 4 Image Processor offers fast frame rates and low noise. As this DSLR is a step up from the crop sensor of its predecessors, the pictures are much more detailed and crisp. Moreover, its autofocus is extremely efficient, and you will notice that in the first use. Its superb ISO performance ensures that your pictures have minimum noise or grainy texture, even in low light settings. You can shoot razor sharp images, even in low light, which gives you plenty of freedom for editing the photos afterwards on your computer. The efficient AF combined with excellent ISO performance is your recipe for accurate and bright photos. The D750’s built-in WiFi lets you transfer photos directly from your camera to your phone, it also gives you the freedom to use your phone to control camera settings and shoot photos remotely. You can now easily shoot photos, upload them directly on to social media and dazzle your friends with them. Built-in WiFi completely transforms your astrophotography session, it gives you flexibility and freedom. This DSLR also features UT-1 Communications Unit which you can use to send images from your camera directly to your computer system over Ethernet. If you invest in an additional adapter, you can send photos to your computer even wirelessly – hassle free. D750 lets you record in HD 1080p, which is simply awesome. You can now record the kind of videos that you see on TV, right from your own backyard or terrace. And that also for a very reasonable price. Its tilting LCD live view just adds to the flexibility that this DSLR offers. Just like the D5 is the master of low light photography, the D750 is the master of flexibility. Keeping in view the reasonable price of the D750, this camera is one of the best DSLR cameras for astrophotography. It is a well built and beautiful piece of equipment that is going to be your best friend on starry nights as well as clear nights. Its ability to capture sharp images even in low light, HD video recording, built-in WiFi, efficient autofocus, and excellent ISO performance make the Nikon D750 a steal. Different from the regular DSLR cameras, the Sony a7R is a mirrorless digital camera that is a wonderful choice for astrophotography. In the world of photography, this is the first full-frame CMOS sensor with a back-illuminated structure. 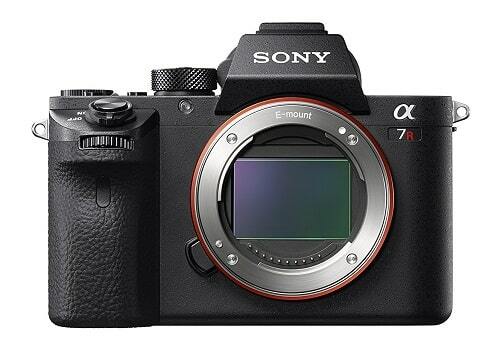 The a7R is a 42 megapixel camera that is sure to take mirrorless imaging to an entirely new level. This camera features a hybrid AF system, ultra high definition video recording in 4k and ISO upto 102400. The Sony a7R features a hybrid autofocus system that includes 399 autofocus points. This ensures that your images are razor sharp and your subject is in perfect focus. With ultra high definition video recording in 4k, you can shoot videos of the night sky and turn them into mesmerizing time-lapses. The video quality is going to make you speechless because this is the world’s very first camera that lets you record in full frame format to internal media. It also gives you the flexibility to shoot a 4k video in the 35mm format. With hybrid autofocus and 5 axis image stabilization, prepare to be blown away by 4k videos. This is a compact camera that will fit perfectly in your palm, enhancing your grip and making it easier to shoot if you are using it without a tripod. The most incredible thing about its hybrid autofocus system is that this camera not only works perfectly with Sony lenses, but also focuses perfectly even with other lenses. The purpose of this innovation is to attract customers to start using Sony cameras, who are mostly dedicated to other systems. The a7R has a strong body made of magnesium alloy so it can withstand tough weather conditions. It features a 3 inch tilting LCD screen which you can use to view and focus on your subject. Because you can tilt the LCD screen, it makes viewing and focusing much more flexible. Featuring a built-in WiFi, the a7R lets you transfer photos from your camera easily and directly to your tablet or smartphone. Although the Sony a7R is a mirrorless camera, unlike the traditional DSLR cameras, it is one of the best cameras for astrophotography. Its mirrorless technology means that it has little shutter vibration, as compared to DSLR cameras, which ensures that your pictures are free of vibration and more stable. Moreover, its hybrid autofocus and excellent ISO performance offer you amazing pictures with more clarity and minimum noise, even in low light. If you want to take your photography and video recording to the next level, this is the best camera for you. It is a digital single-lens reflex camera. Unlike regular cameras, the lens on a DSLR camera can be changed, which is why it is a popular choice among professionals as they can change the lens according to their requirement. Over recent years, it has also become a popular camera among amateurs and beginners in the field of photography due to the flexibility and opportunity for creativity it offers. A DSLR camera uses a mirror that reflects the light coming from a lens to the optical viewfinder, and this is how you can see your subject. Optical viewfinder is the little glass piece through which a photographer looks at, focuses on, and shoots a picture of the subject. Light pollution is also referred to as photopollution. It occurs when unwanted and unnecessary light comes into your lens and brightens your photo, making it appear quite different and brighter from reality. An underexposed photo is that in which the amount of light is quite less, and the photo appears dark. In modern DSLR cameras, when the camera thinks that your subject is dark and does not have sufficient light, it will indicate that your subject/photo is underexposed. Also referred to as ff, a full frame camera includes a sensor that is equal to a 35mm film. The advantage of a full frame DSLR camera is that it takes high resolution photos with low noise, and these are especially useful in low light situations. A full frame camera gives you a wide angle and you can shoot a larger area, as opposed to the traditional cropped frame sensor. A cropped frame sensor crops or cuts out the edges of the frame and you get a smaller image as compared to a full frame camera. Full frame cameras are beneficial for serious photographers as they are quite expensive. If you take a photo from the same distance, a cropped frame sensor will present you with a smaller field of view, and a full frame sensor will offer you a larger view. IR cut filter is an infrared cut filter. In traditional cameras, sensors block red light, including infrared, so that your pictures are as clear as possible. But for astrophotography, you need your sensor to receive infrared to ensure that you can capture all the lights of the night sky. And this is what a DSLR camera designed for astrophotography uses – an infrared filter. Autofocus it the ability of a camera to automatically focus on a photographer’s subject. Most DSLR cameras offer both auto and manual focus. 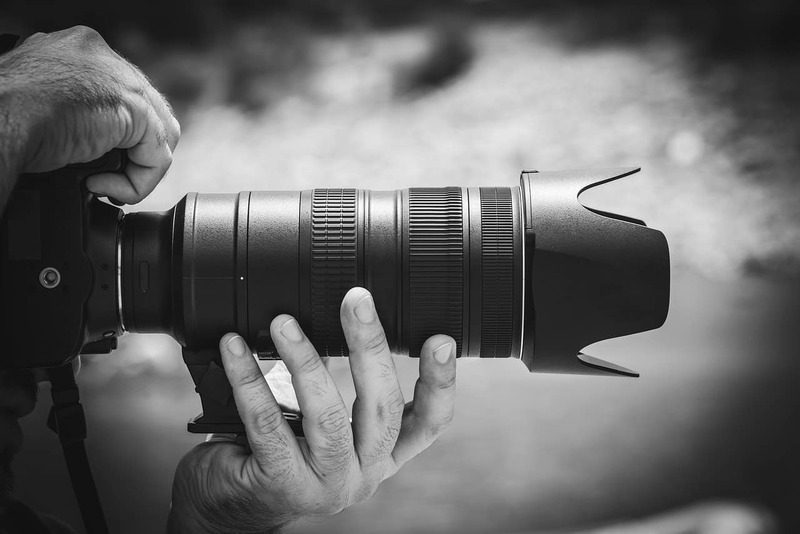 Advanced photographers can easily use manual focus but autofocus is best suited for beginners as well as situations where you need to capture rapidly moving objects. FPS is frames per second and refers to the number of frames that a camera can capture per second. It varies for different cameras. HDR stands for High Dynamic Range. In the HDR mode, a camera shoots a few pictures of the same scene in different exposures to present the photographer with as much detail as possible. The UT-1 Communications Unit is a small device which can be attached to your DSLR camera to easily transfer photos from your camera directly to a computer system through an Ethernet network. This device is especially useful for professional photographers so that they can easily transfer their images directly to a computer system and view them right away, then take necessary steps; it also helps a group of photographers and their assistants collaborate more efficiently. Ethernet is a Local Area Network that is installed on a wide scale. Different computer systems are connected to each other in a Local Area Network and can collaborate with each other, and share data with each other without the use of internet. As its name suggests, a mirrorless digital camera does not include a mirror for reflection like the regular DSLR camera. This means that these cameras are lighter as compared to DSLRs, and offer pictures with lesser noise because there’s little shutter vibration. The camera uses a simple mechanism, with lesser moving parts, therefore shooting clearer pictures. A back illuminated sensor is also known as a BI or a BSI, and it arranges the imaging elements in such a way as to capture more light, and improve performance in a low light setting. 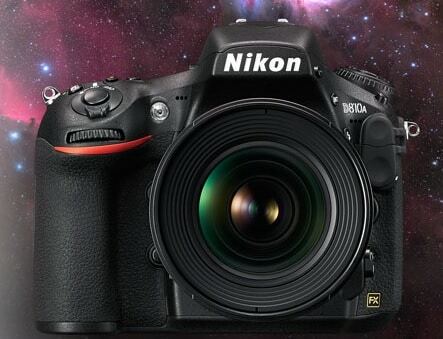 Find the 6 best DSLR Cameras for Astrophotography, including Nikon, Canon and Sony. We also take you though ISO, Sensor Size, Shutter speed and Aperture.